Today I've been participating in RSCON (the Reform Symposium Conference) which has meant that I've had amazing professional development without even leaving home. For most of the day I've been barefoot and sitting at the kitchen table (eating lunch/supervising my daughter cooking) or sitting on the couch. In the coming days I will post about all the amazing sessions I've attended, but this session is about a link I followed after this afternoon's keynote from Dr. Pam Burnard of Cambridge University who was presenting Creativity and Creative Learning: Redefining the Future of Learning. 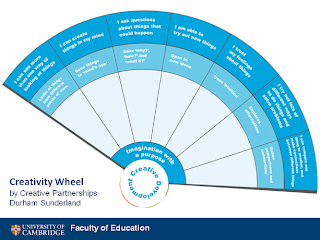 Pam shared with us a link to the Creativity Wheel, developed by a school in Durham in collaboration with teachers and pupils. Teachers filled out a questionnaire to assess current creative development and were released from their classrooms to observe colleagues which helped them to develop a shared vision. 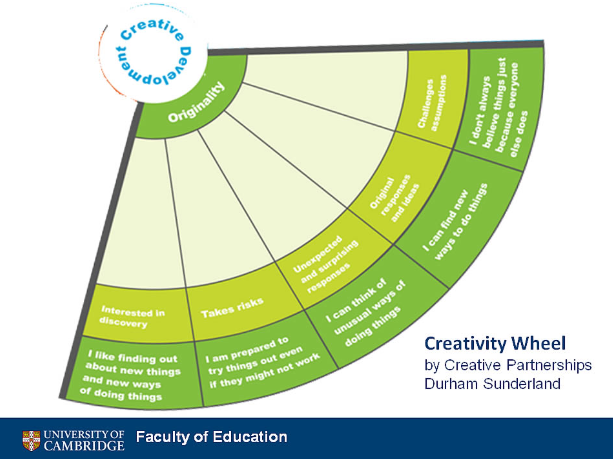 Students were also asked to explore creativity and for their ideas about creativity. The Creativity Wheel was developed as a way of sharing goals with the students and so that they could be involved in ongoing assessment. It is used as a planning tool for teachers so that they can develop appropriate experiences to promote and develop creative behaviour. 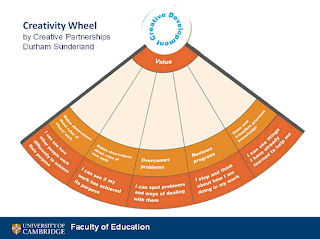 The Wheel is used in all subjects - not just the ones that have traditionally been thought of as "creative". This is defined as imaginative activity directed at achieving an objective - having a purpose and taking action to pursue it. Students tackle questions, solve problems and have ideas that are genuinely new to them - original ideas are the result of creative behaviour. Imaginative activity is only creative if it has value and satisfies what the student has set out to achieve. 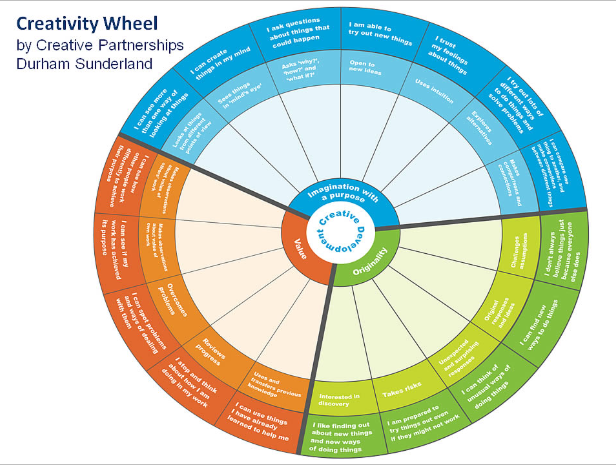 These graphics are quite small, but you can find a link to the wheel on page 11 of this document. More on the rest of this keynote coming soon!